Fixed gas detection systems are installed onsite when monitoring the concentration of gases and detecting gas leaks. The remote gas sensors continuously monitor the air in their vicinity. Each remote monitor works independently of the others. Thus, if there is a failure in one of the monitors other monitors and the central unit continue monitoring. The portable multi-gas monitor is a popular choice for a supervisor wanting to monitor or verify the presence of gases in an unknown environment. The portable multi-gas monitor usually comes with the following gases; Hydrogen Sulphide (H2S), Carbon Monoxide (CO), Oxygen (O2), Combustible Gas (LEL). The sensors can also be changed to measure other gases, such as; Sulphur Dioxide (SO2), Carbon Dioxide (CO2). 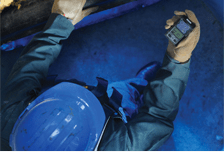 The personal single gas monitor is utilized by onsite workers to acknowledge and alert the worker of the potential presence of a single hazardous gas, most commonly Hydrogen Sulphide (H2S).